Like most people, I hate doing homework. It gets boring sitting there for hours in silence just doing homework so I like to listen to music. I have a few playlists I listen to depending on the mood I'm in while I do homework or study and I wanted to share a few of my favorite Spotify playlists that help make doing homework a little bit easier. When I really need to focus and get a lot done I like to listen to instrumental music or music with very few words because if not it will become a dance party rather than a study session. 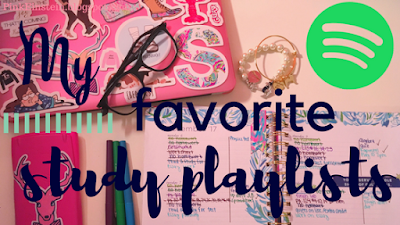 Here are my favorite playlists for when I need to get some major studying in. This playlist is actually one that I created myself and it includes mostly instrumental music from the new Beauty and the Beast, Cinderella, and La La Land. Originally all princess movie music, the playlist is titled with a crown. Homework is always better when it's 50% homework 50% dance party and these are the playlists I use when I'm in an upbeat, dancy, mood! The Be Happy playlist is fun because it has a little bit of everything on it. There's 80's, some musicals, and even a few of today's hits. Danielle Carolan, one of my favorite YouTubers and also the creator of this Girl Boss playlist is all about that girl boss vibe. This ultimate girl power playlist will get you in a good mood and help you to power through that homework. The only things I don't like about this playlist is that it features rap and a few explicit songs. The Dancing Mood playlist is one I created obviously for when I want to dance. The playlist is all musicals and include music from Grease, High School Musical (one, two, and three), and The Greatest Showman. The Disney Channel Throwback playlist is exactly what the title says that it is: Disney Channel music from the early 2000s. Including artists like the High School Musical cast, Hannah Montana, and my favorite, The Jonas Brothers. 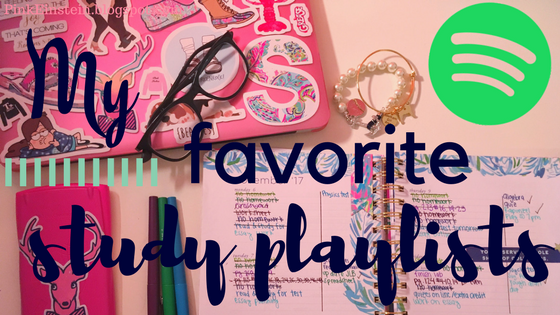 Hope these playlists will help make doing homework a little bit better! I am not sponsored or affiliated with Spotify in any way. Credit to the owner/ creator of the logo that I included in the header picture. To view source used for the logo picture click here.